Soffits and fascia are the part of a roof that is closest to the gutters. The fascia and soffit close the roof envelope outside of the structures walls. This means that they are the first things to be damaged by water if the home’s gutters becomes clogged or a leak in the roof develops. In addition, they can also fall victim to an infestation of insects or nesting birds and other animals. If you have noticed a discoloration and peeling paint, it can be a sign that the soffits and fascia on your home have been damaged. Fortunately, you can take this off of your to-do list by calling PMSS! We will do the heavy lifting for you. We are fully licensed, insured, highly qualified, and ready to properly fix home or office needs. Don’t trust an unlicensed contractor, we will send a qualified crew who will remove rotten wood and then replace it with fresh lumber. FASCIAS are the trim boards at the roofs edge of a house. Fascia at sloped ends of a house or under a gable are called rake fascia, and horizontal fascia that cover the ends of rafters are called eaves fascia. All fascia trim is vulnerable to decay, especially if the roof is poorly constructed. 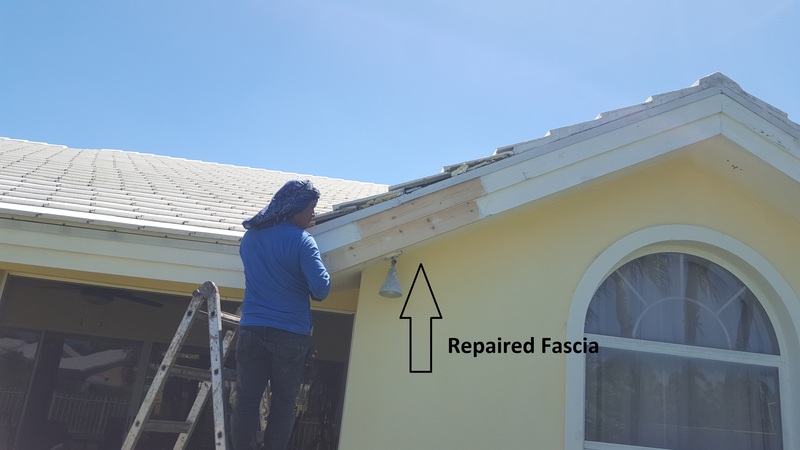 Repairing rotten eaves fascia generally consists of replacing the damaged boards but is much more complicated than one might think. This is because the roof metal flashing that covers the top of the fascia (called drip edge) must be taken off to access and remove the fascia. If one tries to remove the fascia without removing the drip edge, the metal drip edge will get bent and damaged and become an eyesore. The roofing above the drip edge needs to be removed first. Therefore, replacing damaged fascia inherently includes a roof repair above the fascia. 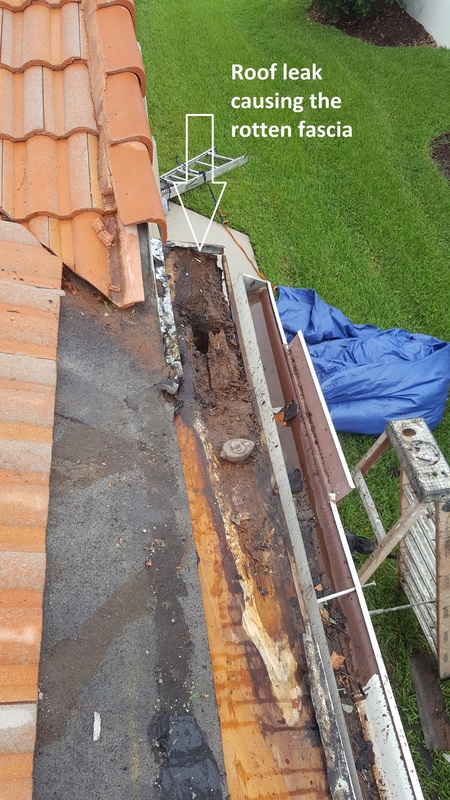 Believe it or not this is probably a good thing because rotten fascia is almost always caused by a leak in the roof above the rotten boards that you can see. If the fascia is replaced without repairing a roof leak above, the fascia will become rotten again. Fascias covered by aluminum or vinyl siding are harder to check. The metal is called cladding. One problem with such siding is that it can hide decaying wood until the condition is too advanced to repair easily. Soffits in Florida are generally constructed of wood, stucco or metal closures. It’s really important to have a soffit in good shape. A well-constructed soffit keeps animals and bugs out. It also protects your roof from wind damage during hurricanes. Soffit eaves and gable overhangs are susceptible to water damage caused by improper flashing, torn shingles, cracked tiles, faulty gutters and roof leaks above. Once water gets in, the rot spreads rapidly because the wood stays soggy in the dark attic space. Sometimes soffits are damage by birds, squirrels and insects nesting inside eaves. These animals have been known to chew or peck through a perfectly sound eave, but they're especially attracted to a water-damaged fascia or soffit, which offers less resistance. Bees and hornets also build nests in and under eaves. Call an exterminator if you notice bees or hornets nesting in your soffit. After you get rid of the inspects you will need to change all of the wood affected by the nest. If the wood is not changes the inspects return and rebuild the nest.